FEAR numbers are very impressive. With AA/AF enabled, the game is silky smooth! There is nothing better on the market! The performance difference between high end and super high end is usually quite small. That's not the case with the 512Mb version MSI NX7800GTX-VT2D512E videocard. Not only is it noticeably faster than the 256MB version NX7800GTX, the extra memory will play a larger role as time goes by the MSI NX7800GTX-VT2D512E is already future friendly. Of course all this performance comes with an extremely hefty price tag. If you feel you need the absolute fastest videocard technology available, a GeForce 7800GTX 512MB is what the doctor ordered. All electrical components are sensitive to static electricity, and given how expensive the MSI NX7800GTX-VT2D512E is, extra care should be taken when handling it. A good rule of thumb is to only ever handle circuit boards by the edges of the PCB - the green coloured fiberglass substrate all the electrical components are mounted to. Handling a videocard (or any computer component for that matter) by the edges is good practice, and decreases the possibility of a static shock damaging an integrated circuit. The other thing we can do as consumers is ground ourselves before installing or removing parts from the computer. The quickest method is to touch the exposed metal casing of the PC power supply. If you get a little zap, your body was holding a static charge which potentially could have destroyed a computer component like the MSI NX7800GTX-VT2D512E videocard. The MSI NX7800GTX-VT2D512E videocard is an impressive graphics card, with an equally unique low noise heatsink. With the 7800GTX core running at its naturally higher clock speed, the heatsink keeps the core load temperatures consistently at or below 50°C. 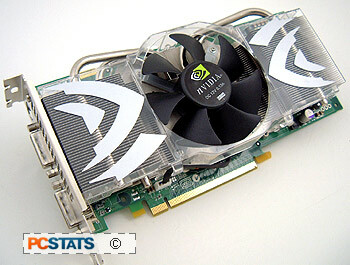 We've tested some GeForce 7800GTX 256MB samples that have maintained temperatures around 80°C. MSI's software suite for the NX7800GTX-VT2D512E includes a full version of Colin Mcrae Rally 2005 which is a nice touch. Considering what we just saw from the MSI NX7800GTX-VT2D512E in the benchmarks, it's clear that this card outperforms the Asus GeForce 7800GT SLI combo easily. The difference between the 256MB GeForce 7800GTX and 512MB versions is also pretty defined, especially in games like Splinter Cell: Chaos Theory, FEAR and Doom 3. When it comes to overclocking, the G70 core on this reference card reached 618 MHz core and 1819 MHz memory. Nice. Toss in the High Definition (HD) content acceleration capabilities of nVidia PureVideo and component output right from the videocard and the deal is sweetened even further. If you think about what two GeForce 7800GTX 512MB videocards could do in SLI... well that's just plain scary. With a retail price of $877 CDN ($749 US) per videocard, the MSI NX7800GTX-VT2D512E is an expensive piece of hardware as videocards go. This is top-of-the line bleeding edge stuff kids. Serious gamers with the necessary hardware to fully compliment a videocard of this stature will get the best return - like the AMD Athlon64 4000+ and Asus A8N-SLI Premium with 1GB of DDR test platform that PCSTATS assembled for example. If your PC isn't already powerful, you really shouldn't even be considering this baby. Yet, for all those with killer gaming rigs the MSI NX7800GTX-VT2D512E can certainly bring a game up to the next level in terms of image quality and visual effects.